Phew… Finally, I’m so grateful. My life is going back to normal. At least these recent days. Sleeping well, no overtime work. In fact, I was sleeping almost 9 hours hahaha…kinda revenge lol. Yesterday, met Aizun neesan at her home. Few days before, she told me that she has a book bout student guide to japan and scholarship, and she asked me whether I’m willing to take it or not, but because I was still busy I couldnt take it. So, I took it yesterday when I had leisure, after I cleaned up my room. I was suprise when I went there. I thought I was lost. Everything has changed. I almost didnt recognize at all. But, I made it hahaha. Its not funny when u get lost. 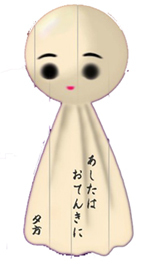 Shall I set up teru teru bozu?